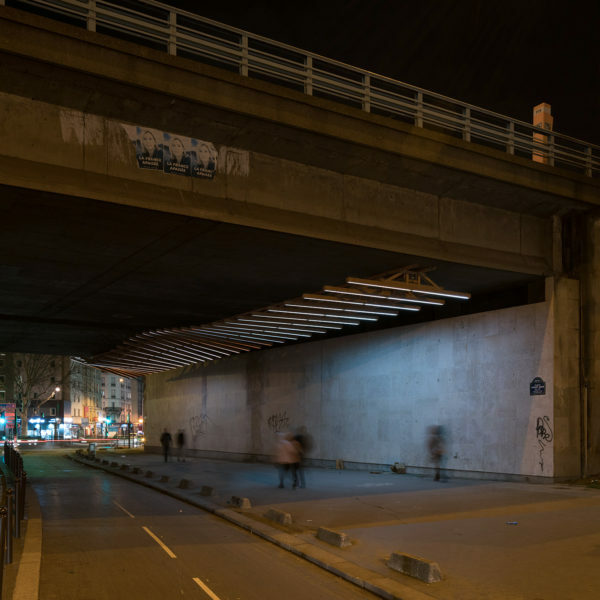 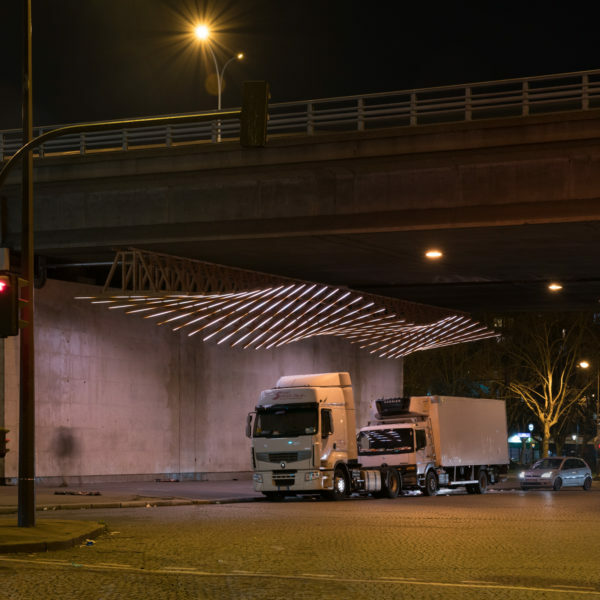 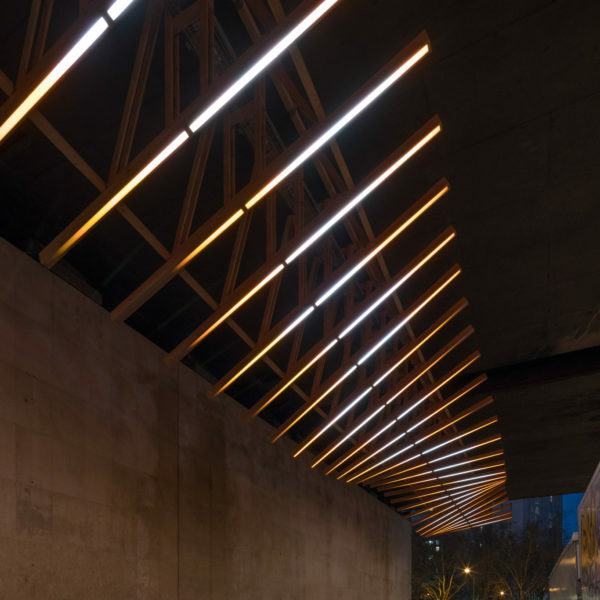 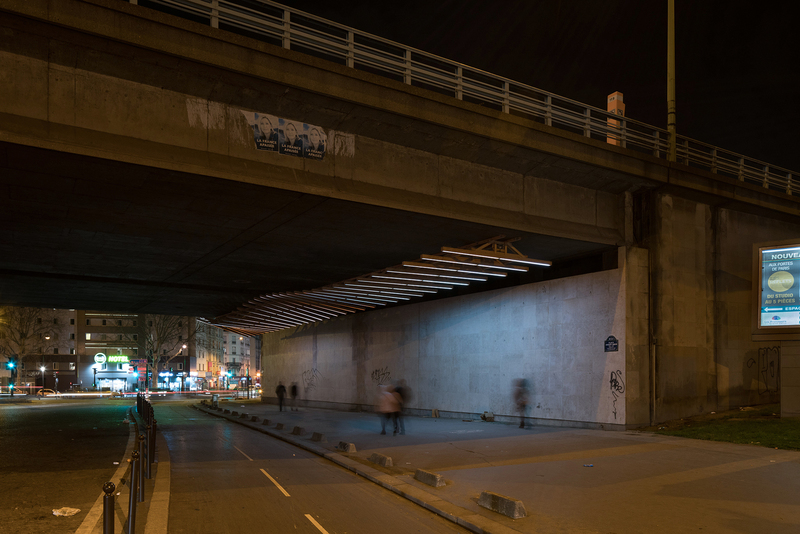 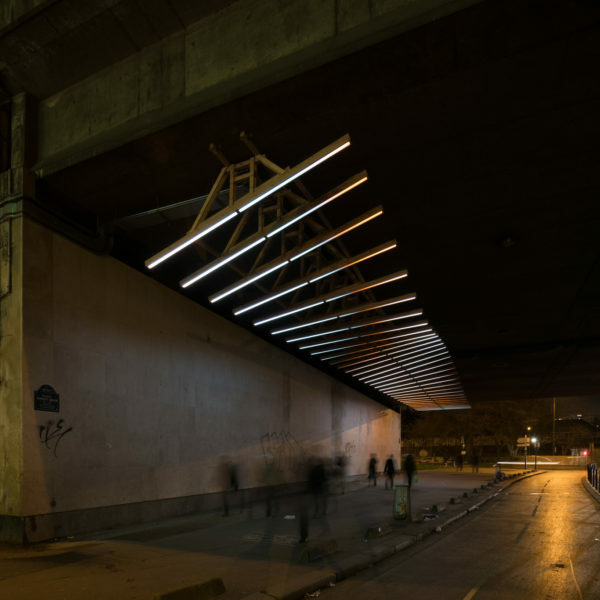 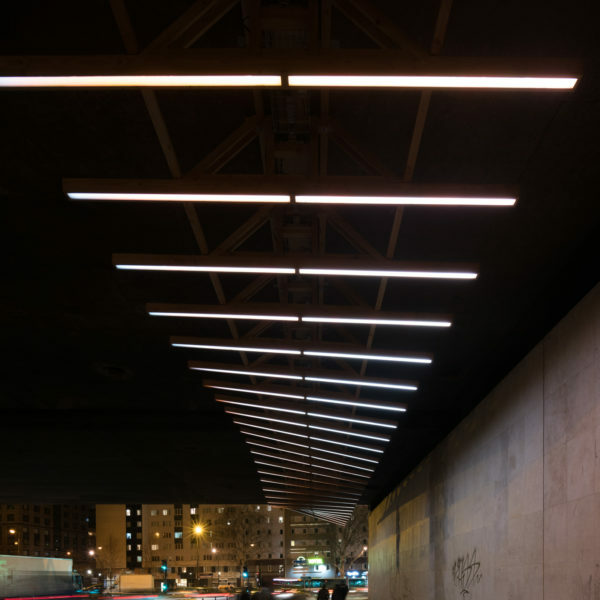 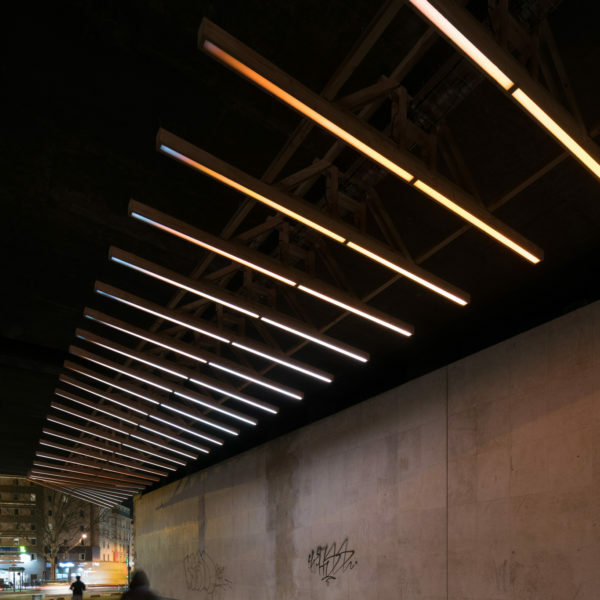 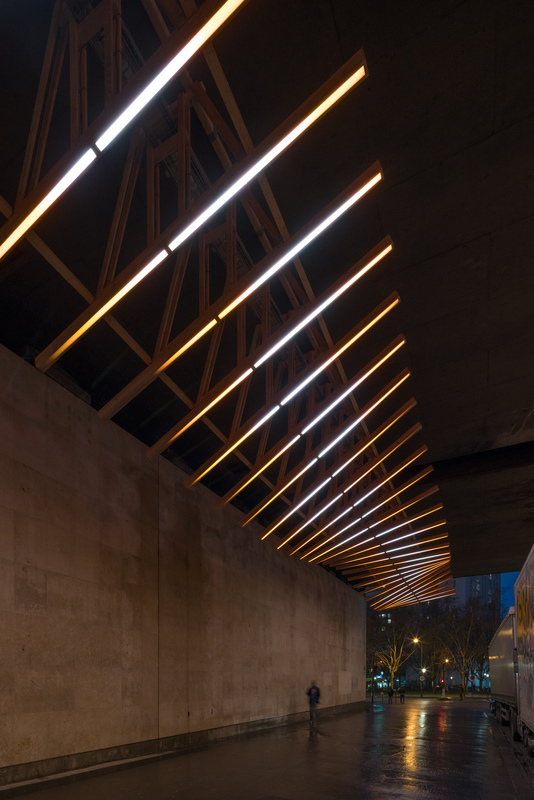 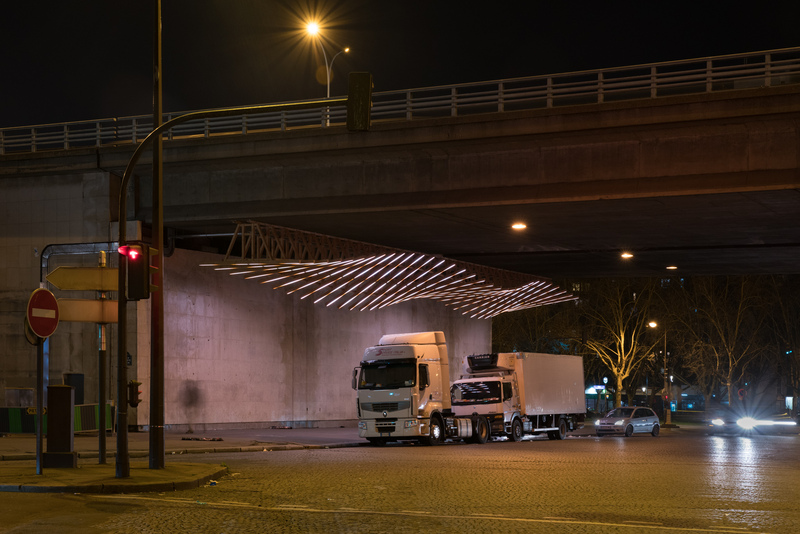 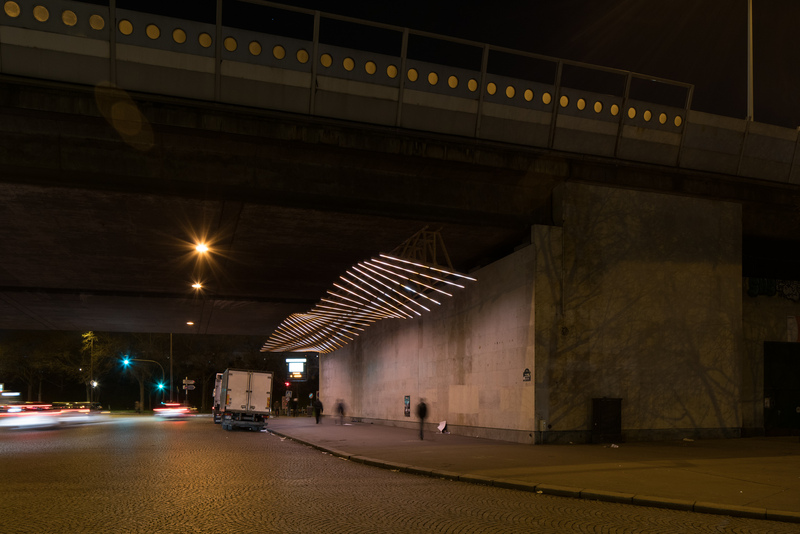 Delta, a sculpture made of wood and light, requalifies the public space of Porte de la Villette. 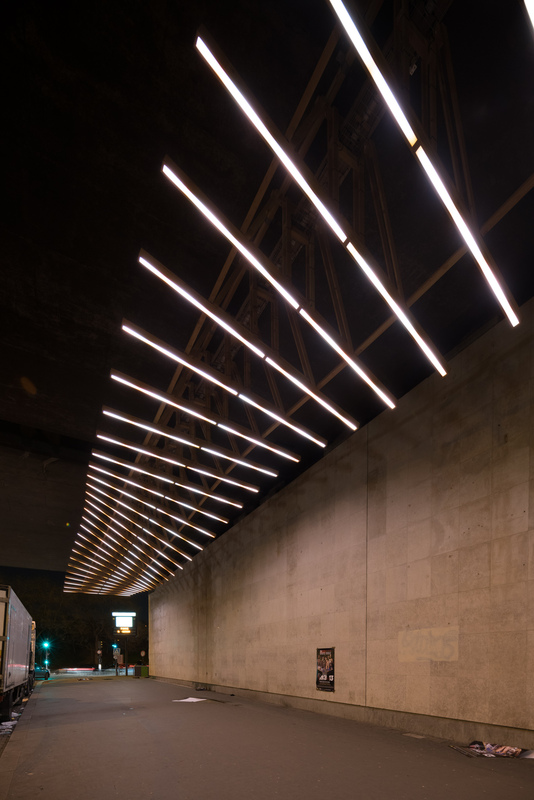 Its luminous undulations accompany pedestrians from one side of the peripheral boulevard to the other. 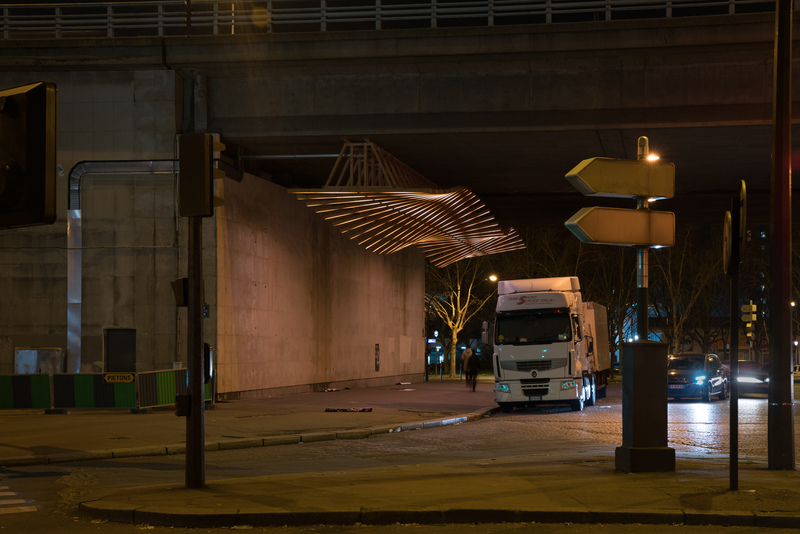 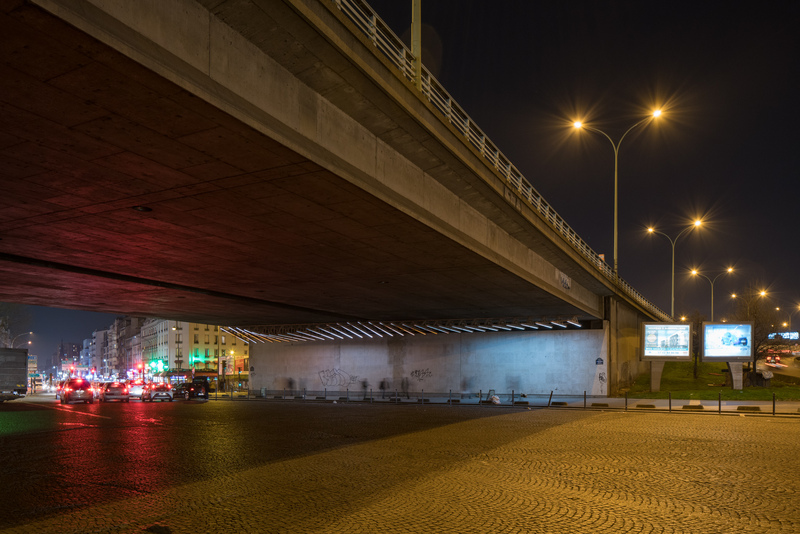 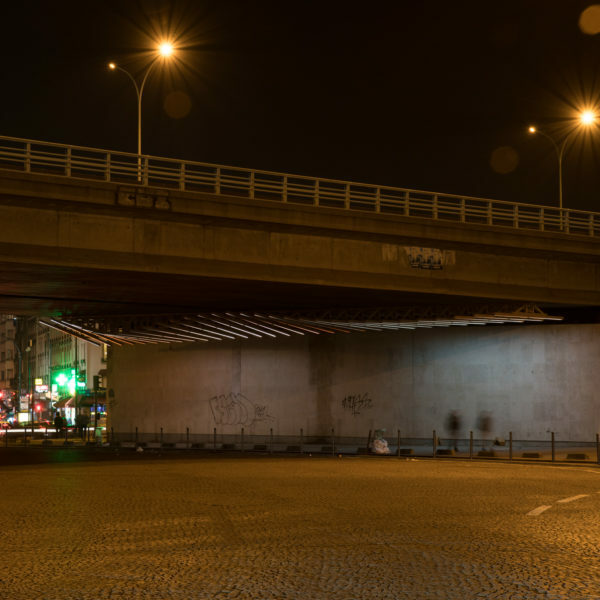 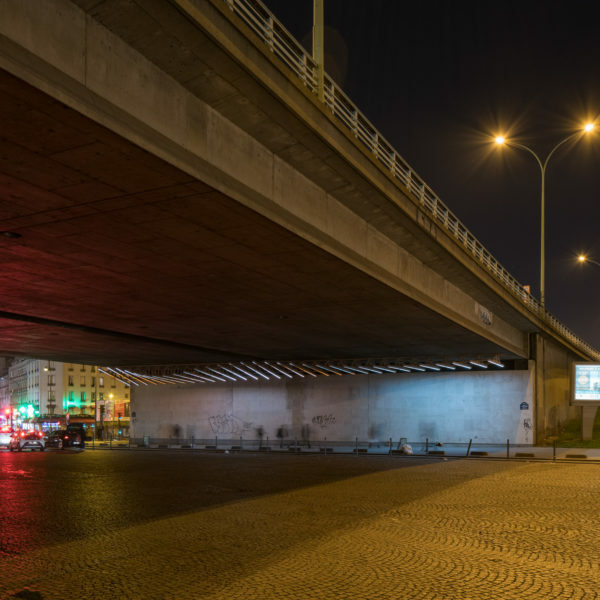 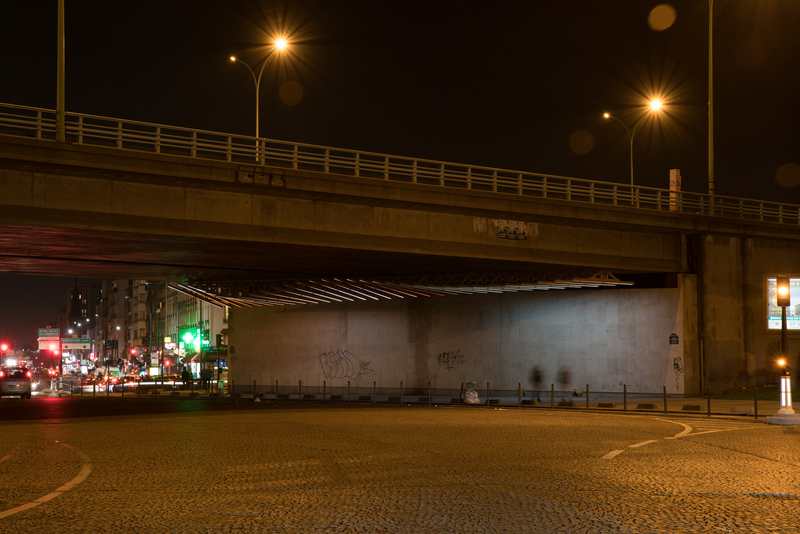 Delta connects Paris, Pantin, and Aubervilliers in a deconstructed movement inspired by Étienne-Jules Marrey’s chronophotographs, notably L’homme qui marche (1883), from La machine animale series. 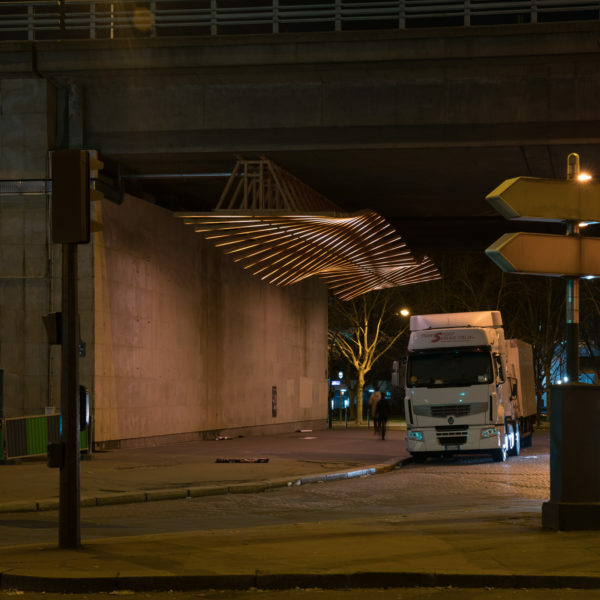 supported by the Paris mayor’s office. 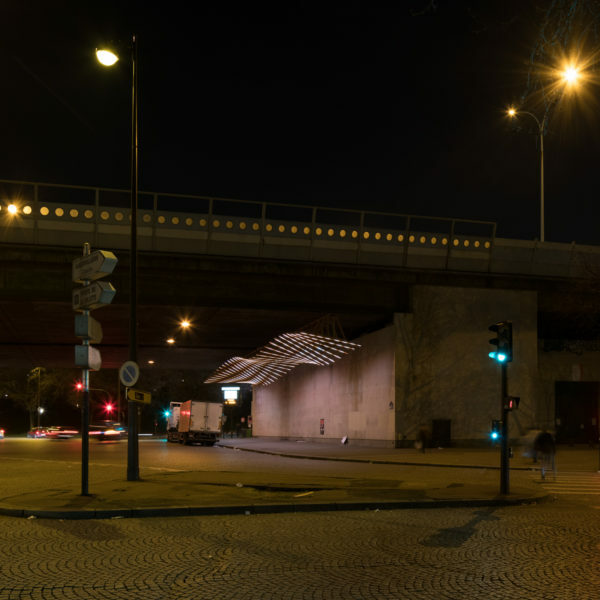 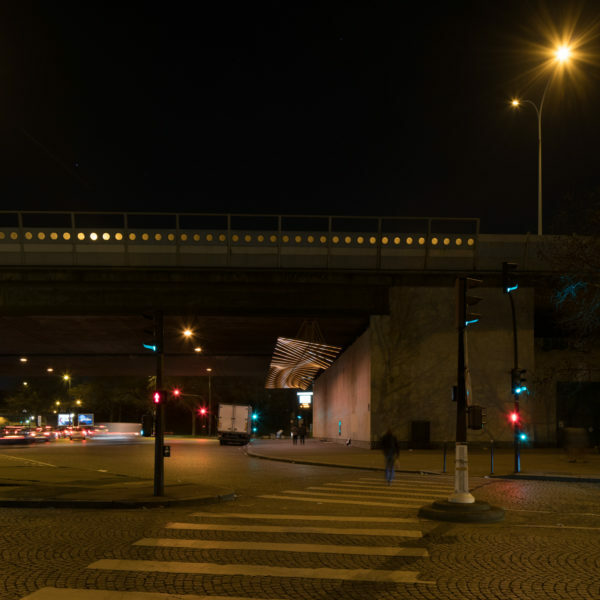 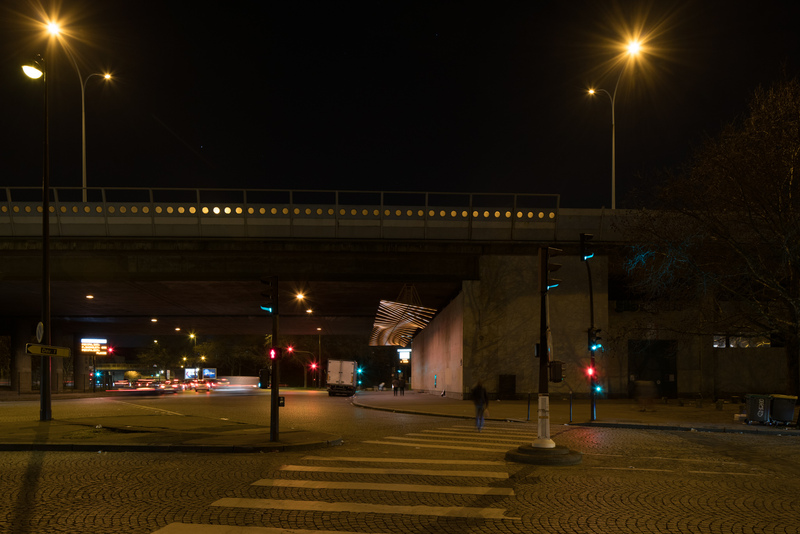 Place Auguste Baron, at Porte de la Villette, the incessant ballet of traffic and noise pollution questions the position of pedestrians within public space. 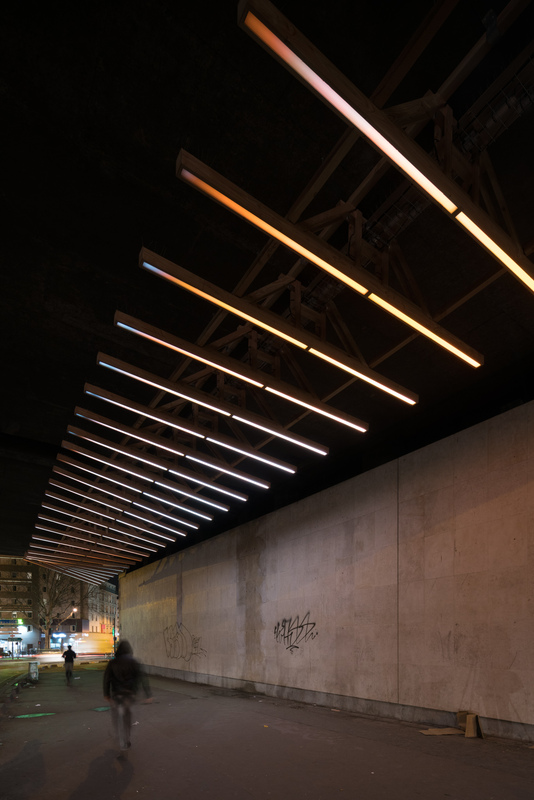 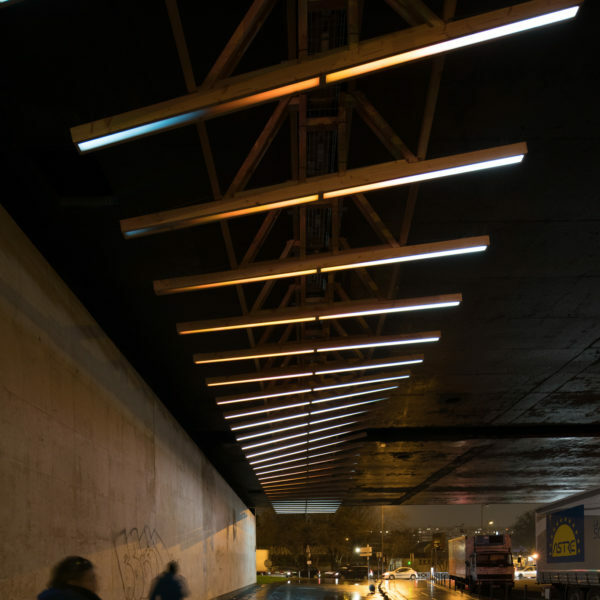 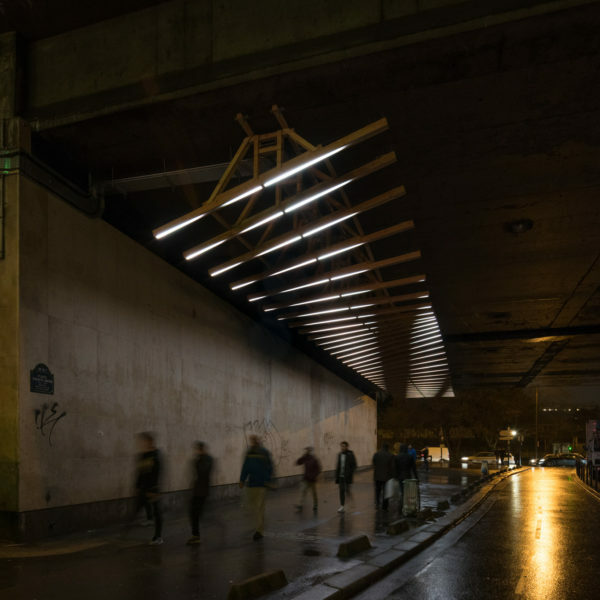 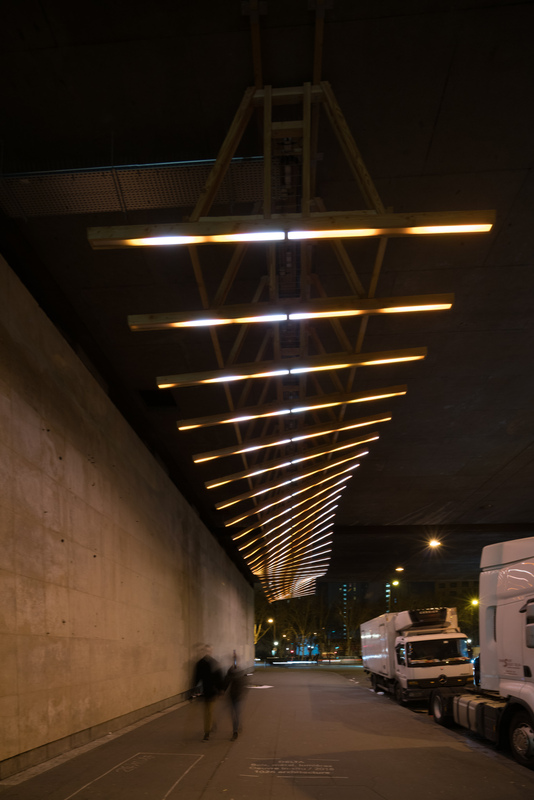 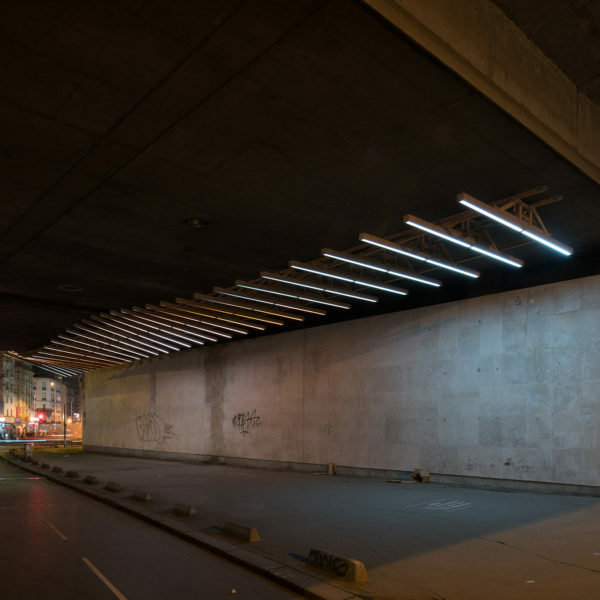 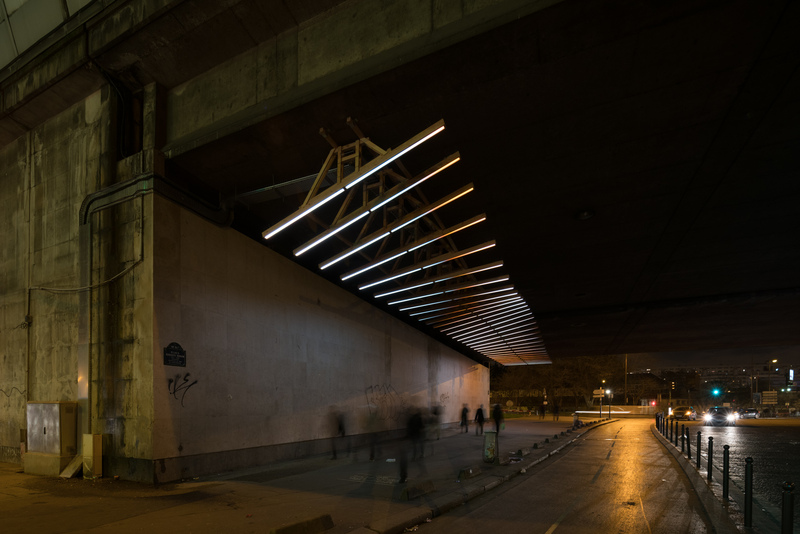 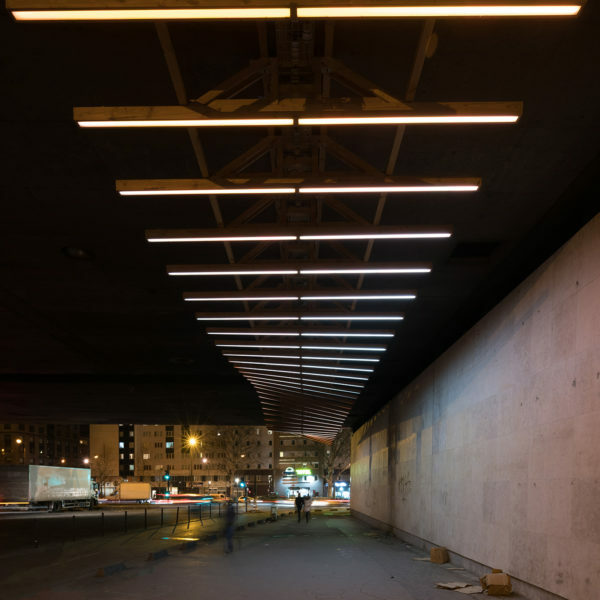 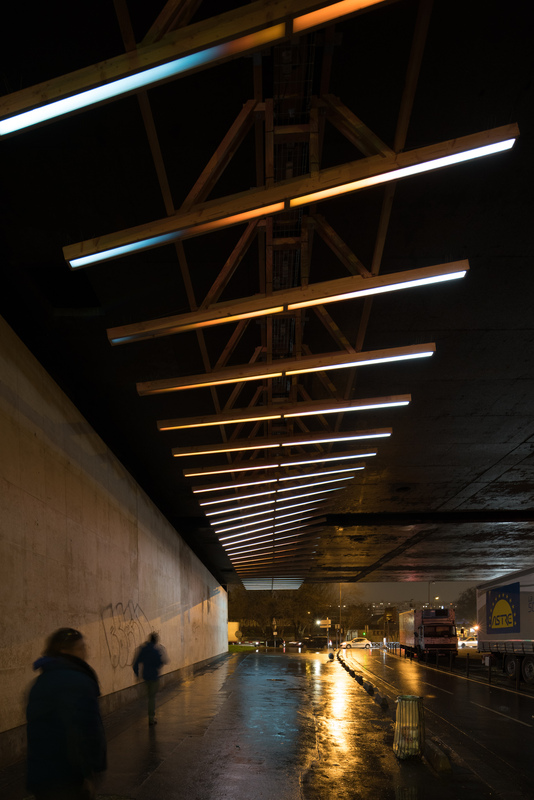 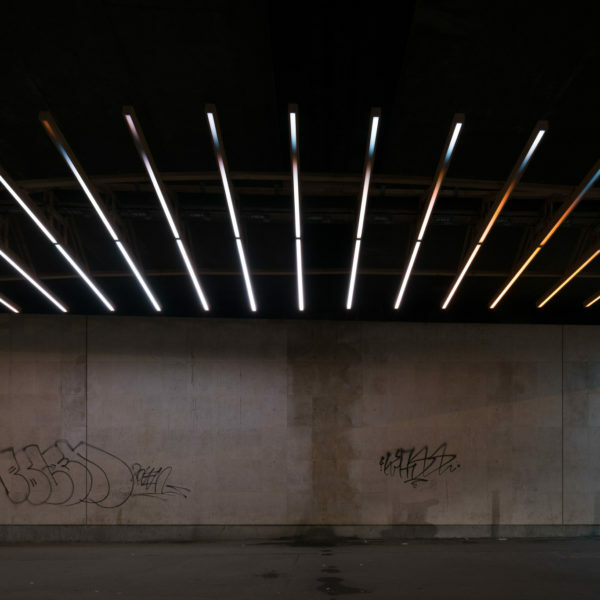 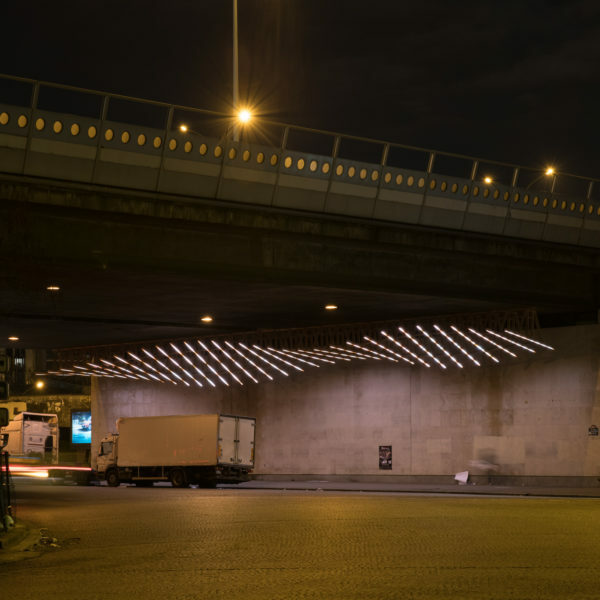 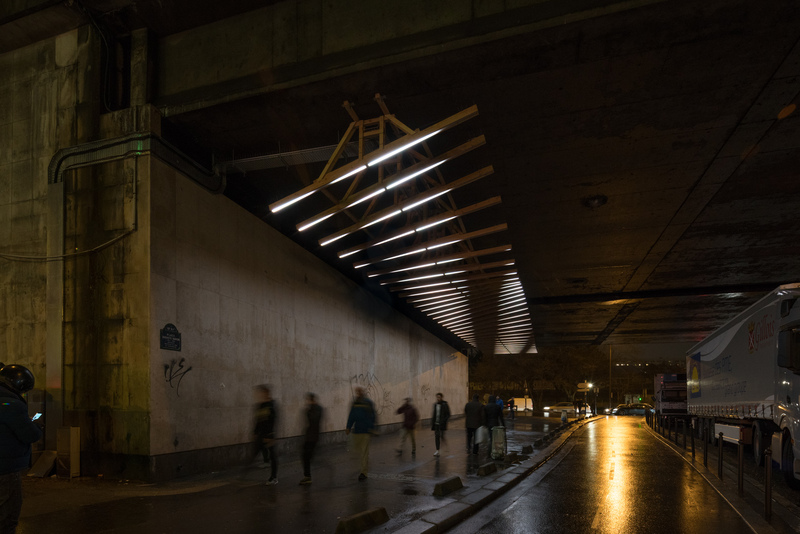 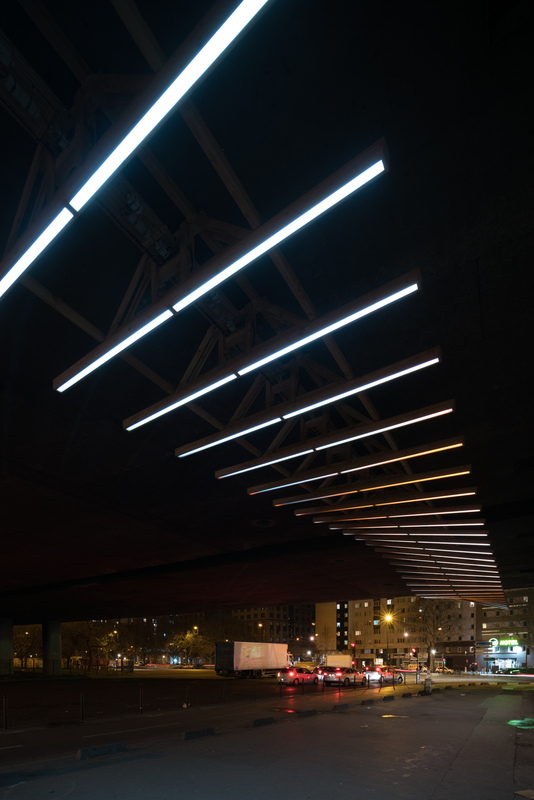 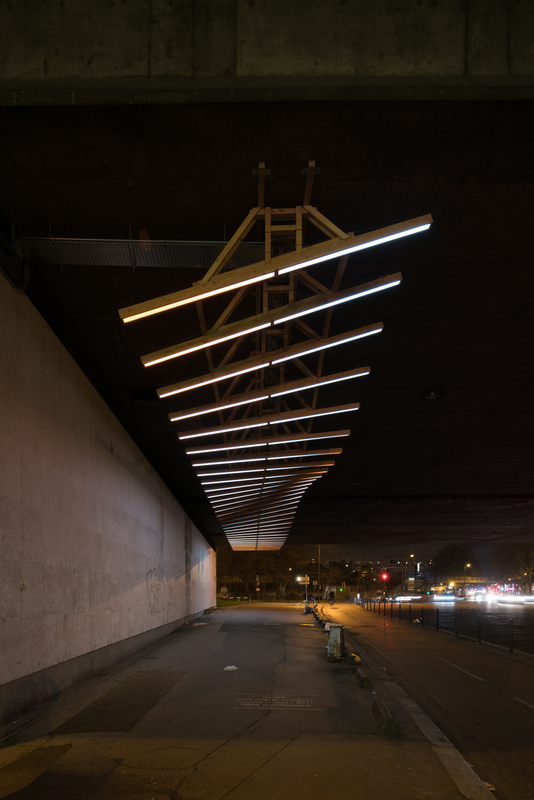 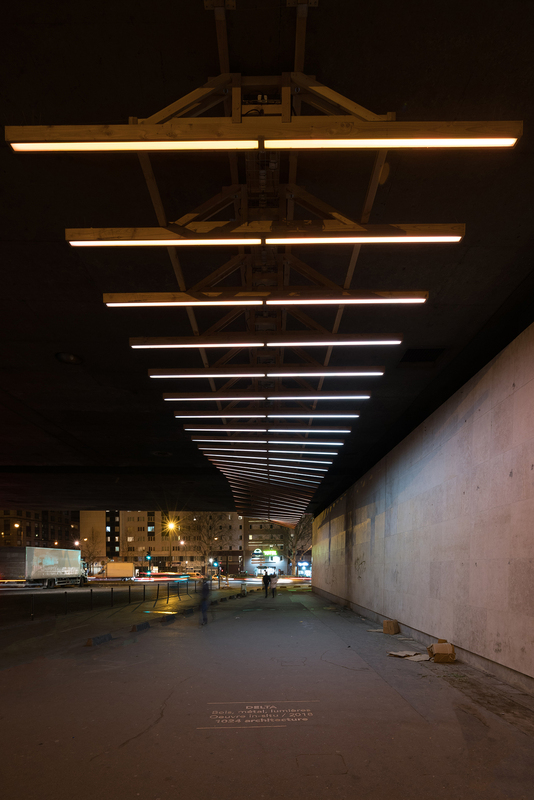 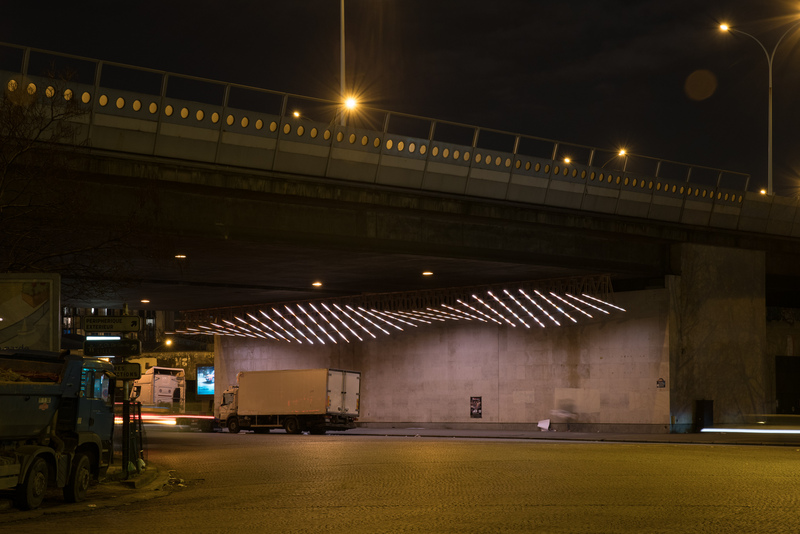 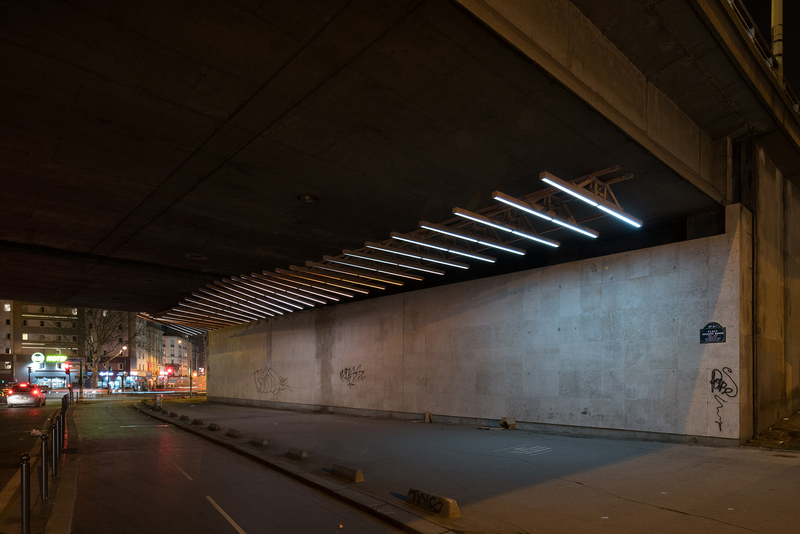 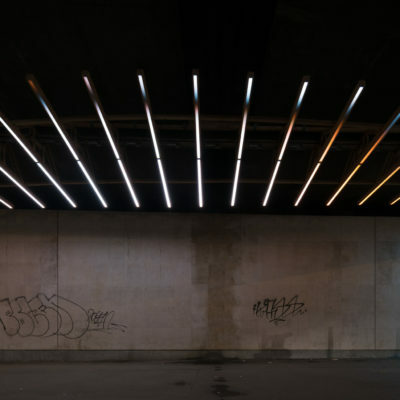 Delta, a digital zebra suspended beneath the ring road, comprises two slender sculptures in wood, metal, and lights placed either side of the place. 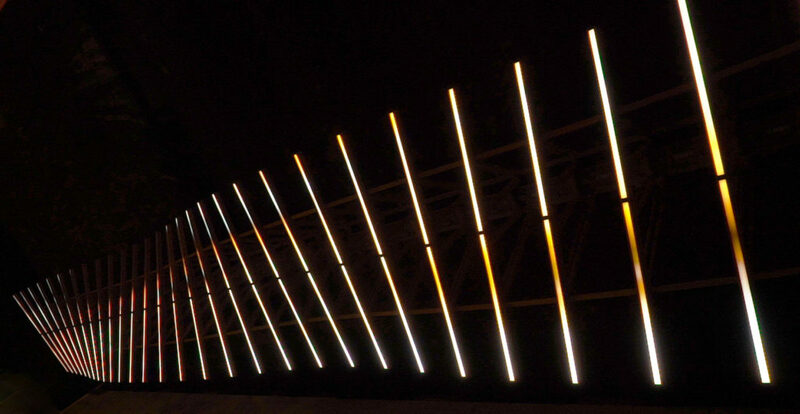 Two series of 32 wooden porticoes, either side of the bridge, guide the pedestrians as they cross. 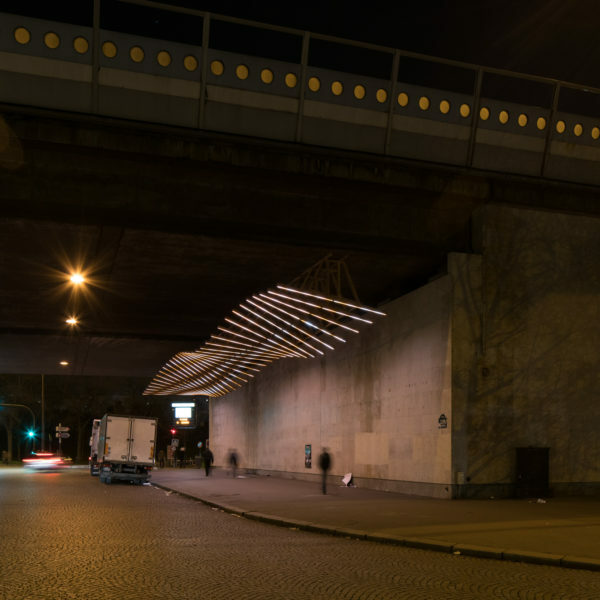 Adapting to the topography, they undulate on the underside of the artwork in a supple and sinuous movement. 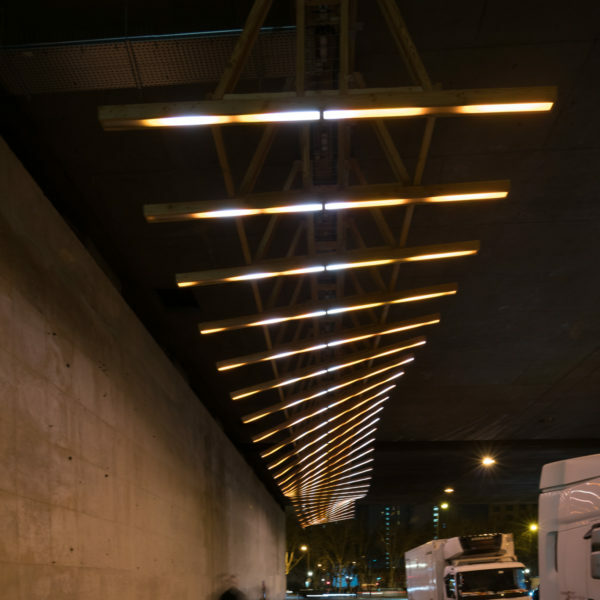 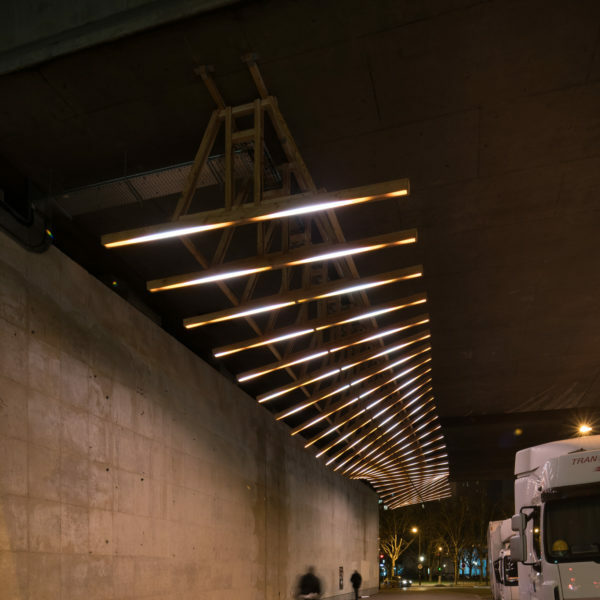 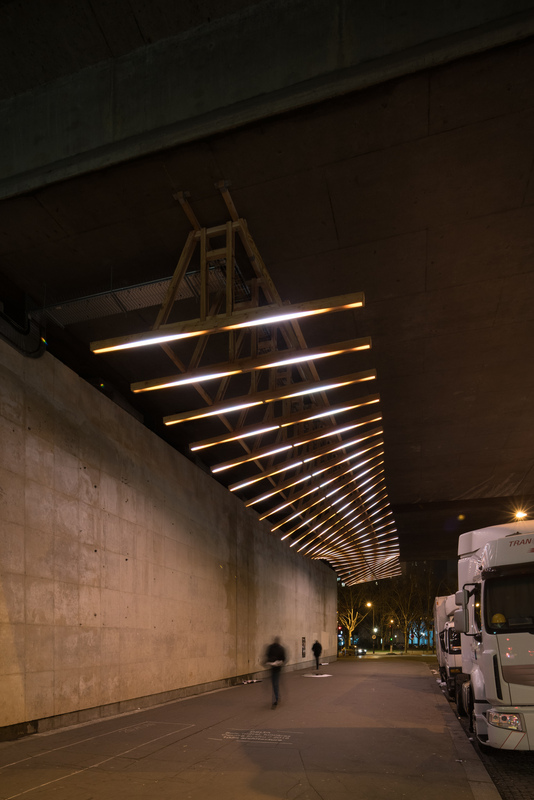 The 4-metre-long wooden beams that are attached to it are equipped with lines of LED lights. 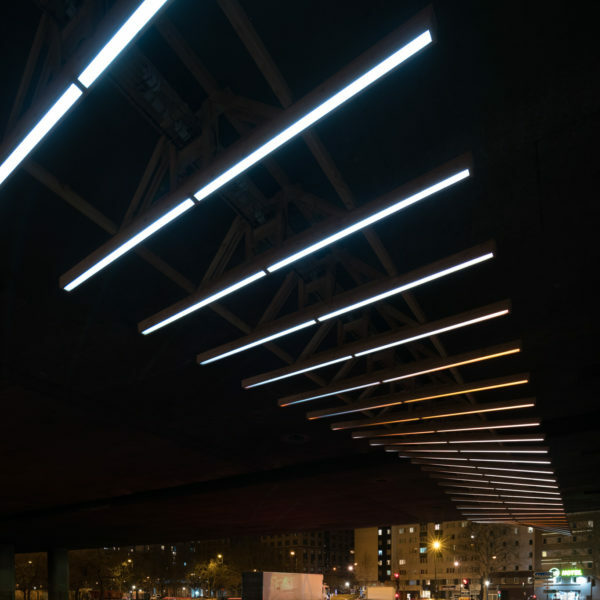 The diffuse lighting, tinted with warm and cold whites, was specially developed for the project. 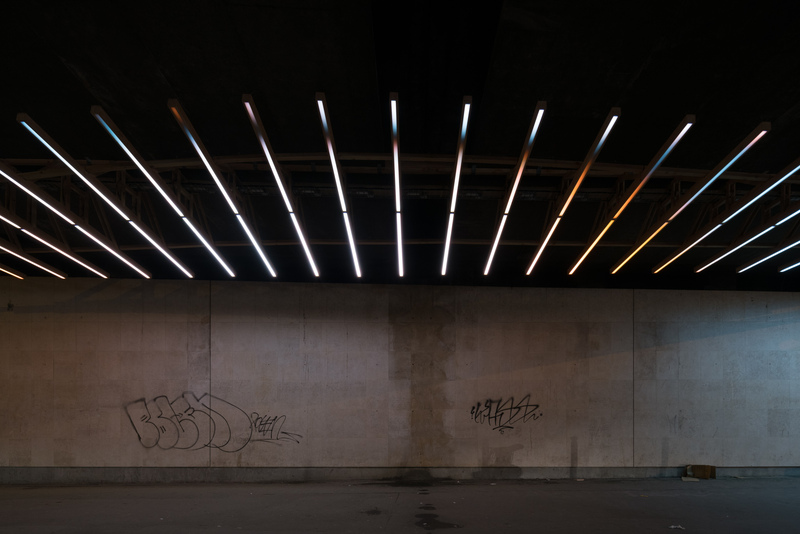 Their colours rework the codes of the city. 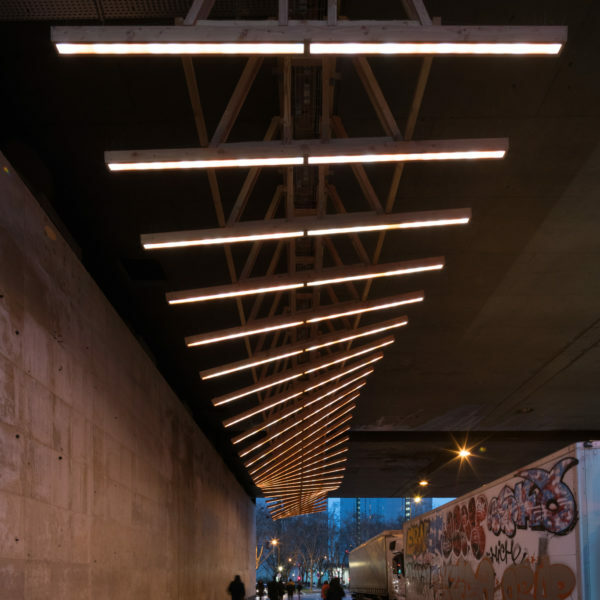 The variations in intensity, sheets and waves of light highlight and fluidify bicycle and foot traffic. 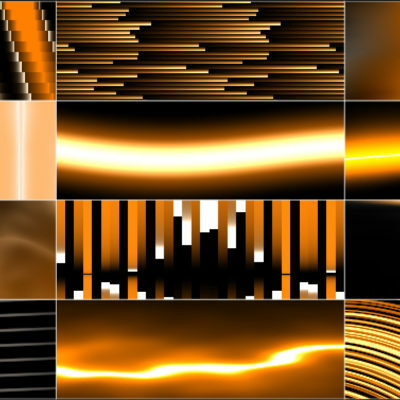 These dynamic behaviours are generated in real time and vary every day. 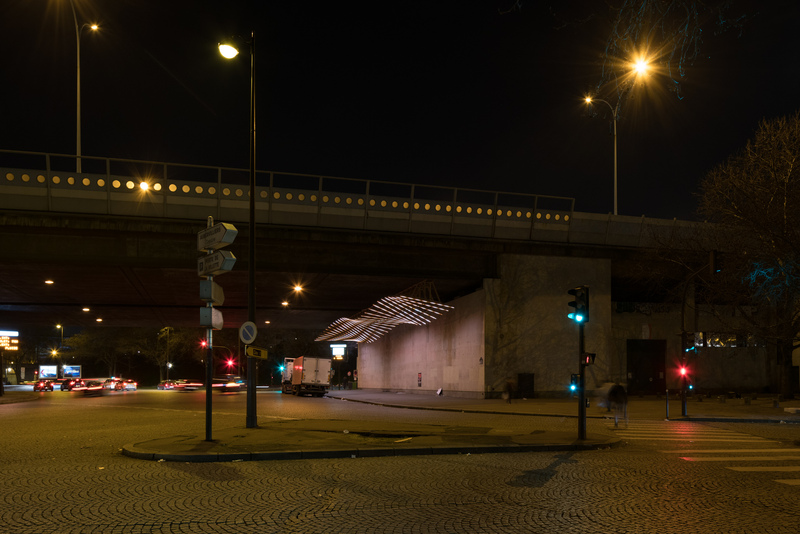 The artwork is synchronised to sparkle with the Eiffel Tower, as an echo, five minutes at the start of each hour, from dawn to midnight. 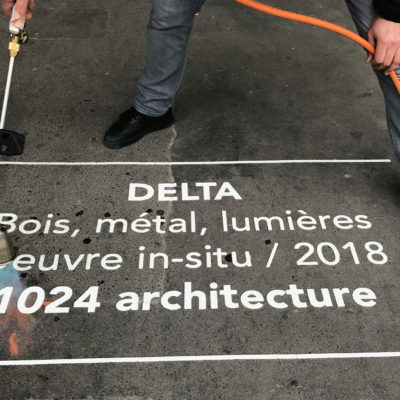 Delta was build by the collective Depuis 1920 in the studios of the Villa Mais d’Ici in Aubervilliers, a few hundred metres from the site of installation of the artwork. 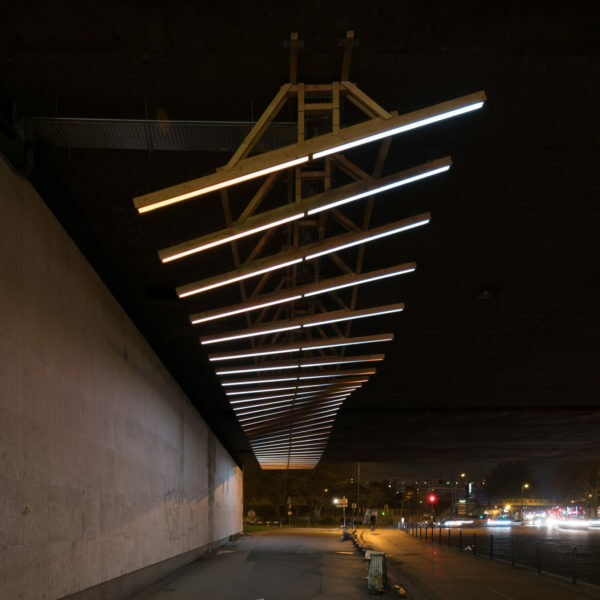 A workshop for building urban furniture was also undertaken with residents from the neighbourhood using offcuts of wood from the project. 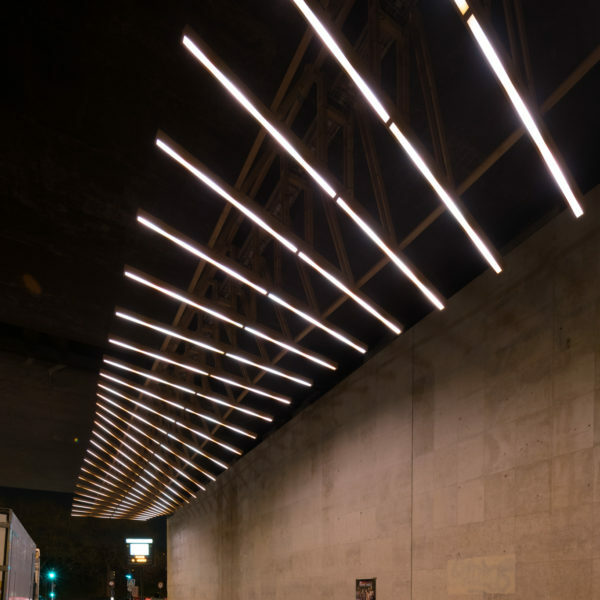 This immersive and bright installation guarantees a new role for pedestrians within public space: one that is gentler, more comfortable, and more pleasant. 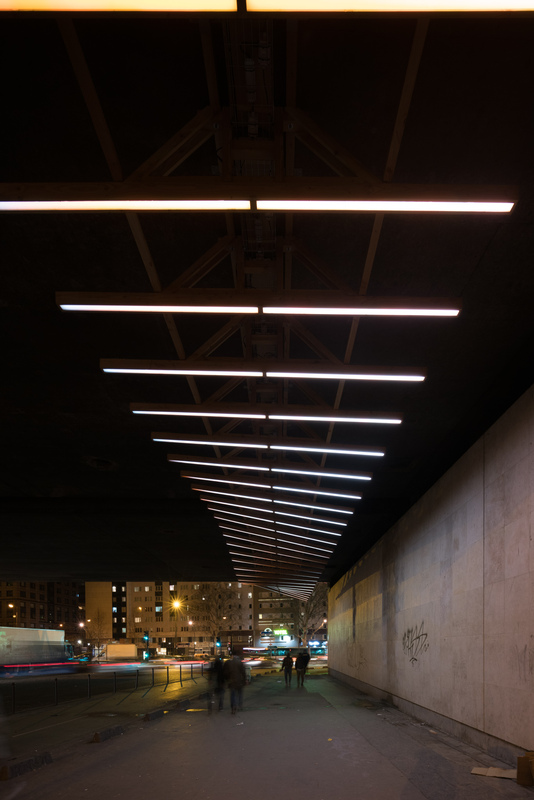 Pedestrians no longer anxiously stare at the ground: they look up, enjoying the illuminations that interact with their route. 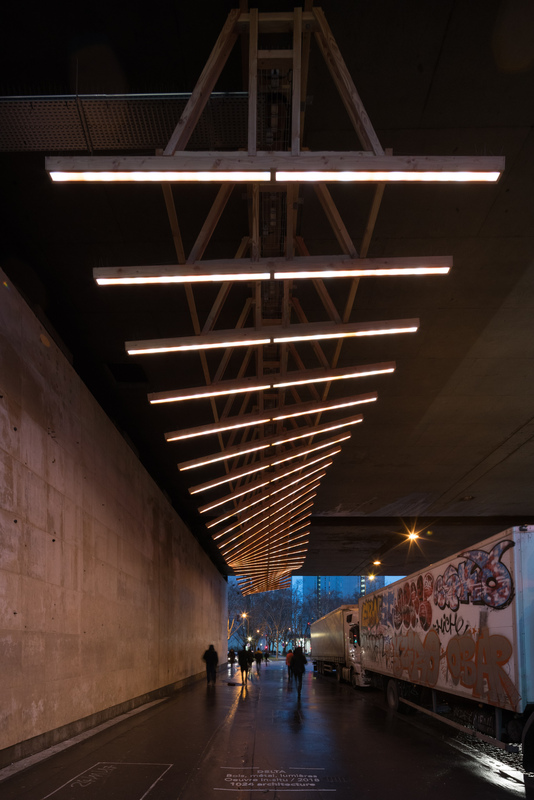 The Delta installation was also combined with the installation of a cycle lane designed during the project period, reinforcing the reappropriation of public space by different kinds of users.